Mike joined the Fox Hollow team in August of 2014 and has proven to be a great team member that delivers impeccable customer service on a daily basis. Mike Hauk, a native of Frederick, Maryland, is currently the Assistant Golf Professional at Fox Hollow Golf Course. He attended Salisbury University where he earned his teaching degree. After teaching for 10 years in the Frederick County Public School system, Mike redirected his career aspirations to golf and the PGA of America. 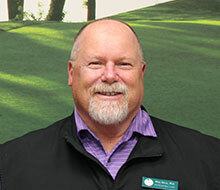 He began his golf career in 1992 as an Assistant Golf Professional at clubs such as Turf Valley and West Winds. Soon after, Mike landed a dream job at Congressional Country Club, where they hosted the 1997 U.S. Open. Mike continued to grow as a professional and held various positions such as Assistant Golf Professional, Head Golf Professional and Director of Instruction at Holly Hills Country Club. He earned is PGA Membership in 2001 and then worked for two years on a start up project at Maryland National Golf club. He returned to Holly Hills before landing at Fox Hollow Golf Course in 2014. During his tenure as a PGA Professional, Mike has participated extensively in the field of education, teaching an average of 200 lessons annually. Mike has experience with all age groups and has said that one of his great joys has been directing the Junior Golf Program at Fox Hollow.